Eudemus of Rhodes was a pupil of Aristotle in the second half of the fourth century BCE. When Aristotle died, having chosen Theophrastus as his successor, Eudemus returned to Rhodes where it appears he founded his own school. His contributions to logic were significant: he took issue with Aristotle concerning the status of the existential "is," and together with Theophrastus he made important contributions to hypothetical syllogistic and modal logic. He wrote at length on physics, largely following Aristotle, and took an interest in animal behavior. 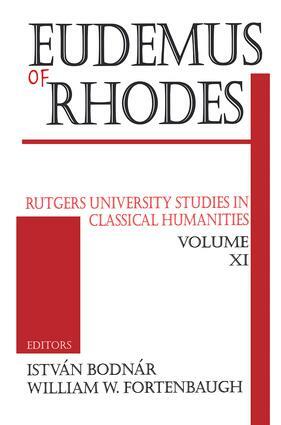 His histories of geometry, arithmetic, and astronomy were of great importance and are responsible for much of what we know of these subjects in earlier times.Volume 11 in the series Rutgers Studies in Classical Humanities is different in that it is composed entirely of articles that discuss Eudemus from a variety of viewpoints. Sixteen scholars representing seven nations have contributed essays to the volume. A special essay by Dimitri Gutas brings together for the first time the Arabic material relating to Eudemus. Other contributors and essays are: Hans B. Gottschalk, "Eudemus and the Peripatos"; Tiziano Dorandi, "Quale aspetto controverso della biografia di Eudemo di Rodi"; William W. Fortenbaugh, "Eudemus' Work On Expression"; Pamela M. Huby, "Did Aristotle Reply to Eudemus and Theophrastus on Some Logical Issues? "; Robert Sharples, "Eudemus Physics: Change, Place and Time"; Han Baltussen, "Wehrli's Edition of Eudemus of Rhodes: The Physical Fragments from Simplicius' Commentary on Aristotle's Physics"; Sylvia Berryman, "Sumphues and Suneches: Continuity and Coherence in Early Peripatetic Texts"; Istvbn Bodnbr, "Eudemus' Unmoved Movers: Fragments 121-123b Wehrli"; Deborah K. W. Modrak, "Phantasia, Thought and Science in Eudemus"; Stephen White, "Eudemus the Naturalist"; J orgen Mejer, "Eudemus and the History of Science"; Leonid Zhmud, "Eudemus' History of Mathematics"; Alan C. Bowen, "Eudemus' History of Early Greek Astronomy: Two Hypotheses"; Dmitri Panchenko, "Eudemus Fr. 145 Wehrli and the Ancient Theories of Lunar Light"; and Gbbor Betegh, "On Eudemus Fr. 150 Wehrli. ""[Eudemus of Rhodes] marks a substantial progress in our knowledge of Eurdemus. For it enlarges the scope of the information available on this author, highlights the need of, and paves the way to, a new critical edition of the Greek fragments of his works, and provides a clearer view of his life, thought, sources and influence. In all these respects, it represents a necessary complement to Wehrli's edition of Eudemus' fragments." -Amos Bertolacci, The Classical BulletinIstvbn Bodnbr is a member of the philosophy department at the Eotvos University in Budapest, where he teaches and does research on ancient philosophy. He has been a junior fellow at the Center for Hellenic Studies and most recently has been an Alexander von Humboldt Stipendiat in Berlin at the Max Plank Institut for Wissenschaftsgeschichte and at the Freie Universitot.William W. Fortenbaugh is professor of classics at Rutgers University. In addition to editing several books in this series, he has written Aristotle on Emotion and Quellen zur Ethik Theophrastus. New is his edition of Theophrastus's treatise On Sweat.